I think I finally have a work space again ! YiPPeE! I wanted to try the modern grid technique from the TJ newsletter again but this time with patterned paper (just a scrap I had in the scraps box) and a saying stamp. 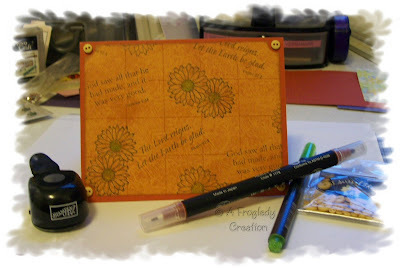 Well I grabbed my trusty Noir Palette Ink Pad and stamped a couple saying stamps from TAC - Be Still T-2890 a few times and it still looked kinda bland so I added the flowers from my Oriental Nature Elements set (ONE8HH) which you can get at Innovative Stamp Creations and it looked better :) Then I used my SU Really Rust Writer to draw the lines. LOL that is the only SU Writer I have - I do like it and wouldn't mind a few more of them in other colors. I used my small SU/ EK Success circle punch to notch the corners out and then mounted it onto a rust colored base card. (paper from The Paper Place, Wellington, OH) I added Matte Finish Buttons in Buttercup (All Sorts of Things) to the corners to fill the notched area on the base card and then used my Spica Glitter Pen in Melon to color the centers of the flowers. It didn't pick up well in the scan but it added a little shimmer to them IRL. Hope you have a wonderful weekend everyone.